In order for me to get this picture I had to be very patient. For one or two days I would stand by my hummingbird feeders, being very still. The hummingbirds became use to me and would start feeding even though I was standing close by. The next day, I would stand by the feeders holding my camera up to me eye without taking a photo. Again, they became use to me being close with a funny looking thing stuck on my face. On the third day, I snapped a picture and this was my reward. Ah, wonderful picture! That must have been so much fun, patiently winning their trust. What tiny, beautiful creations hummingbirds are! They are a delight to work with like that. I love hummingbirds and was given the chance to save one. You may remember reading about that. Yes, this picture was a very nice reward. No photo editing was done to this photo. Thank you so much! When I first took this shot, I was just learning my camera and photography. I thought I had ruined the shot with all the blur in the background. Sure am glad I didn’t delete this photo! Ah! a Beautiful Anna! This last week they seem to have disappeared from my feeders, I was wondering maybe they go south for the ( early Spring we are having), I guess they all went to your house Joy! are you South from BC, Canada ?? I was wondering what species of hummingbird it was. I love watching the hummingbirds, they are so funny sometimes. I’m not sure where you live, but they won’t be back my way until about June (maybe May if it’s warm enough). The red throated are Anna’s Hummingbirds, they have been here all winter (on Vancouver Island) it can get pretty cold here, -10c and snow but not this year. I get Rufous Hummingbirds here in the summer they are Rusty brown / black & white, take a look on my blog, I’ve got quite a few pictures of them. They are really territorial ! They zoom and zagg all over my front porch, it’s pretty neat! They just ignore the dog and me if we are on the porch! The hummingbirds we get here aren’t ruby throated but we do get some hummingbirds that are orange and have metallic orange throats. They are very territorial and run the other birds away from the feeders. But the other species will run the orange birds ragged trying to feed. Finally they will all be at the feeders eating together. It is so funny. Those are Anna’s, the colour varies! they are still beautiful! I was just on Google looking at species of Hummingbirds. I am sure you are right about them being Anna’s, but I was interested in all the species. Seems like all the females are similar looking to each other. Very interesting! Yes, I live in the Four Corners (Utah, Arizona, Colorado and Mexico) the corner where these four states meet. Also, I didn’t realize they flew north for the winter, I always assumed they flew south to the warmer areas. Thank you Cat. More than likely you have seen it before because this isn’t the first time I have posted it. It just happened to fit perfectly for today’s prompt. I wanted to tell you that I deleted Facebook off of my iPad. I am about to run out of memory and I needed to free up as much as I could. I only have 1.3 GB left and once that is gone, I won’t be on the internet anymore (until I can afford a laptop). I wish I knew about the memory. I deleted some apps that were taking up a lot of memory. I don’t think there is a way to put a memory stick on my iPad. But, I will look into it. I have to stop doing photography because that is taking up a lot of memory. You made me laugh. “Just a couple of things that might be useless.” LOL!! Love hummingbirds! My Aunt has feeders and she patiently stood one day as they landed on her shoulders and head. That is wonderful that she was able to get them to trust her so much! I would love to get a photo of that! I do have a photo of it! Will have to try and find it! 🙂 It took a lot of patience of standing totally still! I’m sure it took a lot of patience. It took a lot of patience for me to get that photo. I’d love to see the picture. Great reward! Thank you for sharing this precious moment with us, Joy! You’re welcome and thank you for viewing, reading and for the wonderful feedback! Lovely photo of humming bird, Joy. I wonder how patiently you would have stood to capture it. I love your photo! In Virginia we have ruby throated hummingbirds but the females don’t have the red! The birds here fly south toward Mexico for the winter! I can’t wait for their return! I have never seen the ruby throated hummingbirds here but we also get the Orange throated hummingbirds (and they are little stinkers. They run all the other birds away from the feeders). I’m looking forward to the hummingbirds’ return too! I love watching them. Yes, it is. I plan on trying again this coming summer to see if I can get some more. I really do love hummingbirds. Yes! I used it the other day. But it was the perfect photo for the challenge today. It certainly is! Great choice. This is why patience is a virtue. Beautiful picture! Thank you Francesca! I enjoy the little hummingbirds in the summer. I know but yours was much better!! No way. You captured him in flight! Mine’s just eating, LOL! Yeah but look where it is eating! Beautiful. Your love of colour really enhances this shot! What do you mean? This is how the shot turned out. I didn’t edit it. Forgive me. I thought you were talking about my hummingbird photo. LOL! I couldn’t tell which post you were referring to because I am in my Reader. Oh, you were referring to the hummingbird shot. No, I didn’t do any edits on this photo. Wow, your camera shares your love of colour – the colours are so warm and saturated I thought for sure you had edited the photo! No, I didn’t do any edits on it. There is a big bush behind the birdfeeder that is full of little white flowers, but I don’t know where that yellow comes from. ?? In fact, when I first saw the picture I thought I had ruined the picture. I did not know that the blur in the background was desireable. (New to photography). Thank you! 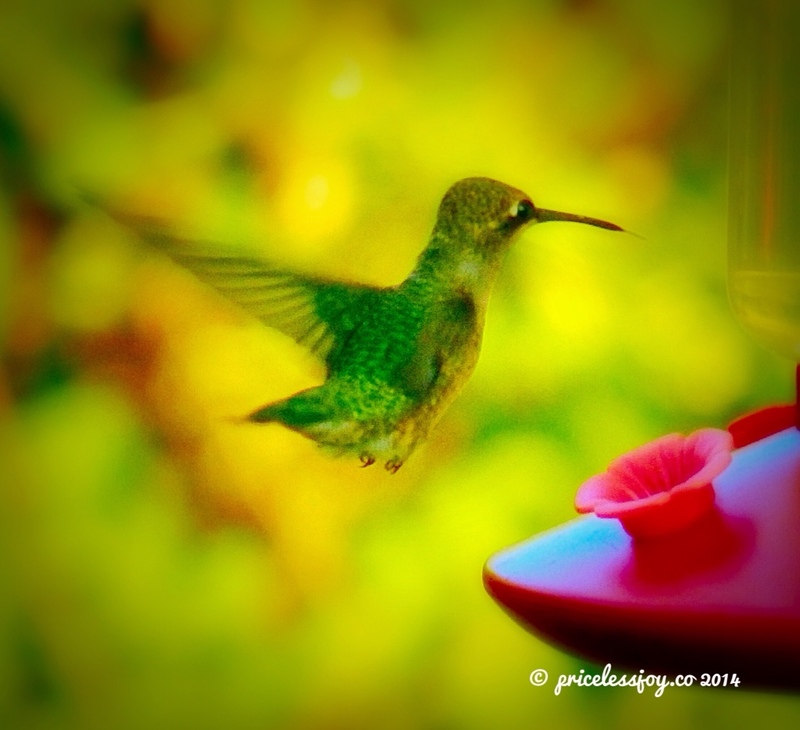 Yes, we are fortunate to get hummingbirds in the summer. I enjoy watching them. Thank you Ady! I honestly thought I had messed up the shot when I first saw the photo. It wasn’t until later that I learned the background coming out that way is desirable! LOL!! (I wonder how many good photographs I deleted, thinking they were ruined). Actually I thought so too earlier whn I started shooting many months back but then I learned it is a nice effect call ‘bokeh’ and it makes the best background 😀 😀 Since then I have been hunting for such shots too !! Haha! Me too! Now that I know it’s desirable, my camera doesn’t do it anymore!! Either my camera isn’t doing it anymore or I’m not holding my camera in the same direction of light. I’m too new to photography to know.